Recorded in several forms including Noris, Norris, Norres, Norriss, Norrish, and dialectals such as Nares, Naris, and Nearise, this is an Anglo-French surname. It has three possible origins that have become intertwined over the centuries. The first and most generally applicable to modern-day bearers of the name is ethnic. It derives from the Norman-French pre 10th century word "norreis", meaning a northerner, or more pragmatically a Norseman or what we now know as a Viking. The dukedom of Normandy in France means the place of the North men, since it was settled by Vikings in the 8th century a.d. When the Norans invaded England in 1066, they were often fighting their own long lost relatives who were by then English. The second possible origin is topographical and English. It was a description for someone who lived "at the north house". This would be one on the north side of a village or settlement. The name is a fused form of 'Nor-hus' from the pre 7th century words "nor", meaning north, and "hus", a house. An early recording from this origin is that of Adam de Norhuse of Essex in the year 1206. The third possible origin is French and occupational. Probably introduced after the Norman Conquest of 1066, it originates from the French word "norrice", and describes a nurse or tender of the sick.. 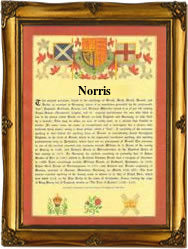 The first recorded spelling of the family name is shown to be that of Robert Norreis. This was dated 1148, in the "Winton Rolls" of the county of Hampshire, during the reign of King Stephen of England, 1135 - 1154. Throughout the centuries, surnames in every country have continued to "develop" often leading to astonishing variants of the original spelling.